Lots of discussion today about a clock, a public convenience and apples, it reminded me of a sketch from Halls Pictorial Weekly (for those of you old enough to remember, it was popular way back in the last century). A summary here would not do justice to all of the comments below, you will have to read them all yourself, I guarantee you will enjoy. [https://www.flickr.com/photos/[email protected]] That's where I'd found too. Yes, and the clock is still there, but I can't arrange streetview to show the clock and cathedral, so i think the clock has been moved. The clock at the NIAH: Freestanding cast-iron clock, c.1910, comprising cast-iron pillar on fluted pedestal having clock face over with pinnacle. Road fronted on a triangular site on concrete brick cobbled footpath. Appraisal This clock is an attractive feature of street furniture that is of artistic and technical significance, having been designed as an aesthetic, as well as functional, piece. We also see a cast iron public convenience, I think. [https://www.flickr.com/photos/gnmcauley] Is that not a different clock? At least the support looks much thinner in the newer photos. The NIAH claims since 1910 for the current version. 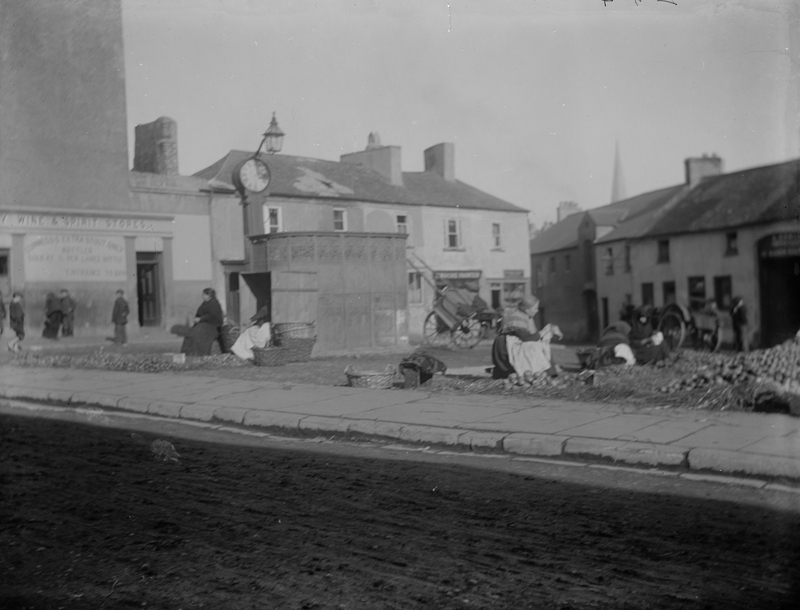 There are another 2 photos of the Apple Market on the NLI: one, two. Both show the market in full swing. [https://www.flickr.com/photos/[email protected]] We will have to talk to the OSI people and let them know that we need uninterrupted access to the viewer between 9.00 am and 11.00 am each weekday. There was a clock in the Apple Market up until the 1950's but it was not the one shown in the photo above which must have been removed sometime earlier. The clock currently in the Apple Market is a very recent addition. WHAT IT SAYS IN THE PAPERS A flavour of the Apple Market from the Munster News… October 1929: A prominent salesman complained that people weren’t eating as many apples as they used to. Demand was down and prices weren’t good. Eating apples were running at 4 shillings per 100, and cooking apples at 8 shillings. Sometimes there were as few as seven carts selling. He told of how there used to be 3 or 4 rows of carts from Piltown and district. March 1931: At a meeting of Committees of Waterford Corporation, the Borough Surveyor reported on the Clock at the Apple Market. He “had the pillar of the clock cleaned, and the works required cleaning. He had got Mr. Parker to carry out the necessary repairs, and reported he would have an estimate of the lighting cost for the next meeting”. July 1933: Temporary altar was installed at the Apple Market and Solemn Benediction was given during the annual Waterford procession in honour of the Blessed Sacrament. Apparently huge crowds knelt in adoration for the Blessing of the Host. October 1937: Cooking apples sold for 4 shillings per 120. Eating apples went for 5 shillings per cwt. Producers still coming from Piltown and other districts to sell them. November 1954: Big hoo-hah at meeting of Waterford Corporation about Sunday trading at the Apple Market. One Alderman complained about hawkers arriving into the city in lorries, selling what was described as a “pile of smash”. Though nobody seems have been too exercised about a few women selling apples, “because that was not street trading in the completely accepted sense”. The City Manager was concerned that a bye-law against Sunday trading would mean Sunday newspapers couldn’t be sold, and also that “poor unfortunate children going to Tramore could not buy an apple in the Apple Market”. One gentleman, horrified that Catholics were shopping on Sundays, queried if it was possible “that people have sunk so low”? Alderman Lynch said “women were selling apples at the Apple Market longer than any of the members could remember, and, whatever steps they took to prevent hawkers, they should make sure that they would not interfere with an ancient custom as far as these women were concerned”. (In a meeting a month later, it was said that apples had been sold at this spot “since the time of the Danes”!) March 1959: Undertaker James Falconer’s Consul car was stolen from the Apple Market and a car earlier stolen in Kilkenny was found parked in its place. A kinder class of car thief back in the day? January 1965: The hands were removed from the Apple Market clock (for repair?). “It is a big loss at the present time, much more so because of the fact that Hughes’s clock, which is more or less in the vicinity, has been taken down consequent on the sale of the premises”. (According to an article in April 1969, the clock had been demolished during the past couple of years, so presumably the hands were never repaired or replaced.) March 1967: Obviously our chalet de necessité had been removed at some stage, as a 3-man sub-committee of Waterford Corporation was set up to decide whether a a new public convenience should be built. December 1967: Shop keepers calling for the Apple Market to be expanded, and for more car parking spaces. June 1968: Mass Radiography Public Sessions were held there for people to have chest X-Rays. [https://www.flickr.com/photos/[email protected]] I was obviously completely misremembering, Paul, because I had originally thought there was a clock surviving at the Apple Market into the 1980s. [https://www.flickr.com/photos/[email protected]] Paul, that pic of the market without a clock shows where the clock today is, but the clock in the Poole shot is at the North end of the market, I think? [https://www.flickr.com/photos/gnmcauley/]The NIAH may be correct in its description of the current clock however as far as I know it has no historic connection to the Apple Market. The first clock there was erected by the Waterford Gas Company in the 1860's but I don't know when it was removed. swordscookie back and trying to catch up! 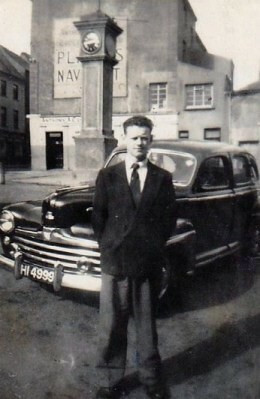 [https://www.flickr.com/photos/[email protected]] Very nice Paul and good of you to dig out the shot from 1955! That is an impressive clock to be sure! Long awaited OSI 25" map quite unhelpful. The lady on the right is very likely a woman by the name of Margaret (Peggy) Ryan who was an apple seller. She lived not too far from there at Brown's Lane, one of her great great grand daughters is married to my brother in law. This is a photo of her taken some years later at the Apple Market and is from an old A.H. Poole postcard.